Prom 1991. The picture is fuzzy. It was probably taken with a disposable camera, but you can still see my hair...You could probably have seen it from space. My oldest daughter is going to her first Prom this weekend. I was holding this little bald baby and I blinked—suddenly she's the same age I was in the picture above. The boy in the picture's name is Carl. This was his senior prom. I was a sophomore. Pulling out these old pictures, I realized it's been over 25 years since I've seen him. That's just crazy. I do apologize for the low quality photo. There is an official photo somewhere...or maybe not. It is quite possible it was destroyed in a fit of teenage rage, but that's a story for another time. In honor of the season of high schoolers in tuxes and tulle, I decided it was only appropriate we swap some prom stories. I have plenty of personal ones, but these were what I found for you. This is a new thing that seems to be catching on: Proms for adults. That kind of sounds like the seventh circle of hell for me, but I don't go to class reunions either, so what do I know? You could a totally sweet, romance out of this. Two people who never got to dance at their first prom finally get their chance. Of course, you could go all Carrie about it as well. The girl who got bullied at her prom returns for the ultimate revenge. Prom 1992. Same guy. Even bigger hair. There's a long story here. Let's just say you don't always make the best decisions at sixteen. I was a junior. He was out of school. This was one of our last dates for several reasons. The biggest being the other girl he was seeing. This has several examples of people who took cardboard dates—which would be a hilarious twist in a YA, but it also mentions kids tweeting celebrities for prom dates and actually having the invitation accepted! That got my suspense brain working. People impersonate celebrities all the time. What if the person who should up was actually superstar of the moment, but some one with much more nefarious plans? 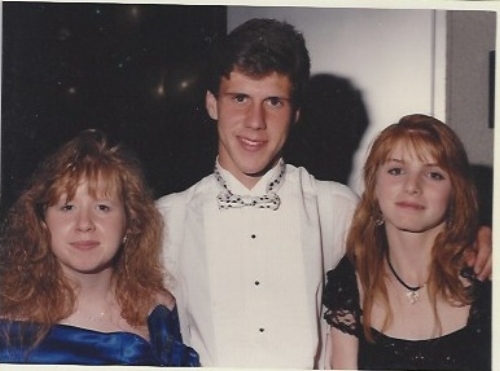 Prom 1993. Better guy! Better hair! There's a great story that goes with this picture. The short version is a boy I'd met once and wrote letters (yes, on paper. No internet) to for four years came all the way from Massachusetts to take me to my senior prom. One of the best nights of my teenage life. And my hair... Well, that's how my hair looked pretty much everyday. I had a salon appointment. The lady did something crazy to my very thick, long hair. It was supposed to be glamorous, flowy curls. It looked like a poodle who'd been left in the dryer too long. Half an hour before we were supposed to leave I got in the shower and started all over. Then when my friends showed up, I left for my senior prom...with wet hair. Jenny, my high school best friend. Our friend, David, and me with the flattest hair in the picture! Jenny is a stand-up comic in OKC now. David is a public school teacher in the town where we grew up. The last story I have for you is a sweet one and the people in the picture above totally would have done this for each other. They brought the prom to him! *sniff* First thought has to be a YA, right? Something John Green-like. But what about the hospital staff that decorated for them? HIs parents? The grumpy old man down the hall who remembers his first love when he sees a girl walk by in the same color dress and decides to set out on a journey to find her after all these years? If you write that one, he better FIND her at the end! None of this, "Ahh, she died last year." crap. I won't stand for it! So, what could you do with these? What about your prom stories? Got anything to swap? I'll trade you the sordid details of what happened after the picture in the red dress! Before you go, I am sending out my first newsletter in May. If you enjoyed this plot swap, please sign up to have news and reviews sent straight to your inbox once a month.